If you are a seller that needs to cancel a completed transaction that a buyer marked as paid, see: How do I cancel a completed transaction? Sometimes during a meet, a seller or buyer may want to edit or change the details of a transaction or cancel a transaction completely. 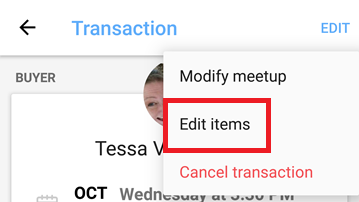 When editing a current transaction, a seller can remove an item or change the price of an item, modify a scheduled meetup, or cancel the whole transaction. A buyer can remove an item or cancel a transaction. If a seller unreserves all items for a buyer, or the buyer cancels their interest on all items, the entire transaction will be cancelled. A seller can remove an item from a transaction or a buyer can remove an item from their transaction shopping cart. Click on the edit button and deselect the items you no longer want in that transaction. Unreserving or canceling interest on all items in a transaction cancels the transaction. Tap "Edit items" or "Cancel Transaction"
Tap the "Save" button once all edits are complete. You will see your changes reflected on the transaction screen. Please note - editing the price of an item via the transaction screen does NOT change the asking price listed on the item visible in the community. Only the seller and the buyer can see the details of a transaction. 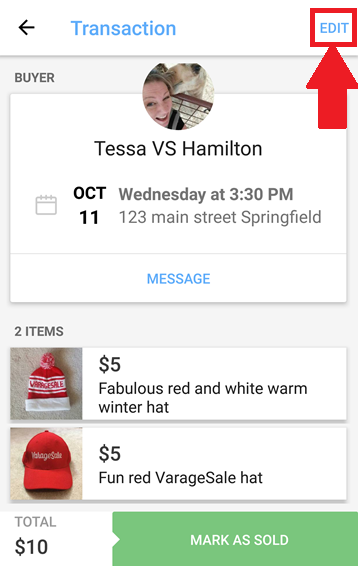 A seller can cancel an item from a transaction, by unreserving the item. Click here to learn how to unreserve an item. A buyer can cancel an item in their transaction by removing their interest on an item. Click here to learn how to remove interest on an item. 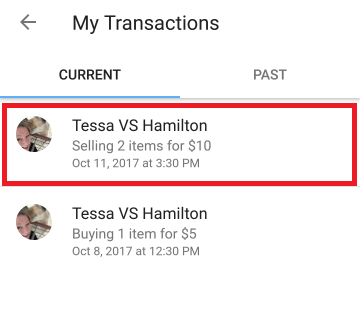 Unreserving or canceling interest on all items in a transaction cancels the transaction.